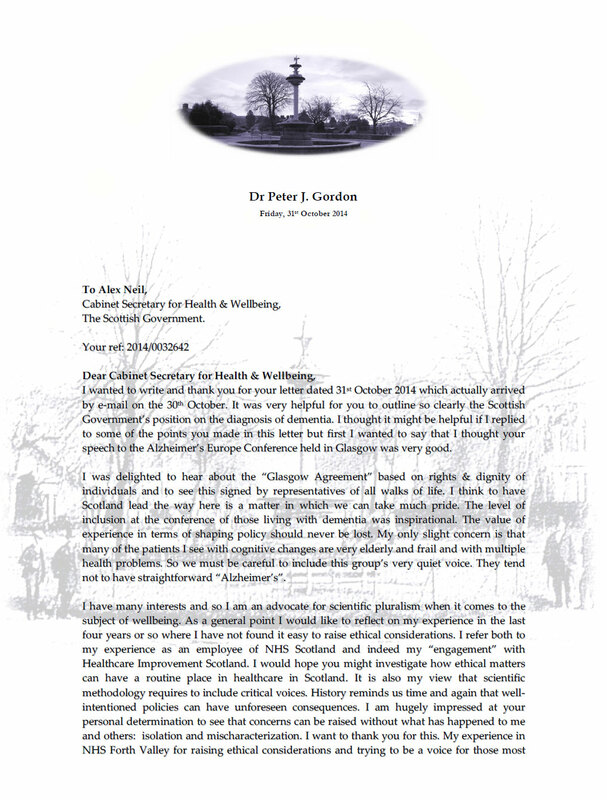 On the 30th October I received this most helpful reply from Alex Neil, MSP, Cabinet Minister for Health and Wellbeing for the Scottish Government. The full letter is as follows and my full response below that. My view is that the lesson Scotland has for NHS England as to regards our approach to the diagnosis of dementia is important. 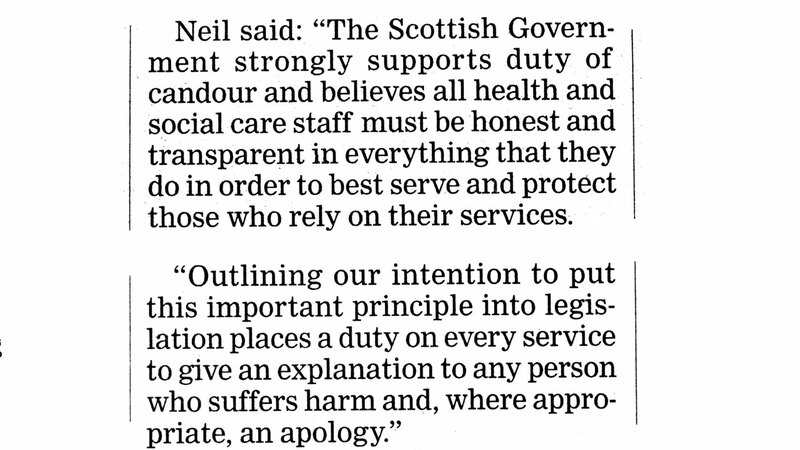 My view is that it is not the lesson as portrayed by the Scottish Government. Please read my letter and see what you think? 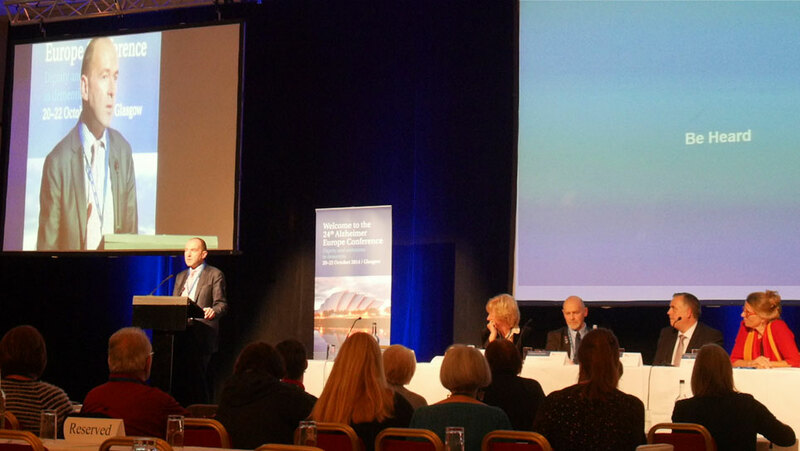 It is not always easy to read image files, so below is an html version with a few added photographs that were taken at the Alzheimer’s Europe Conference held in Glasgow between 20th and 23rd November 2014. I wanted to write and thank you for your letter dated 31st October 2014 which actually arrived by e-mail on the 30th October. 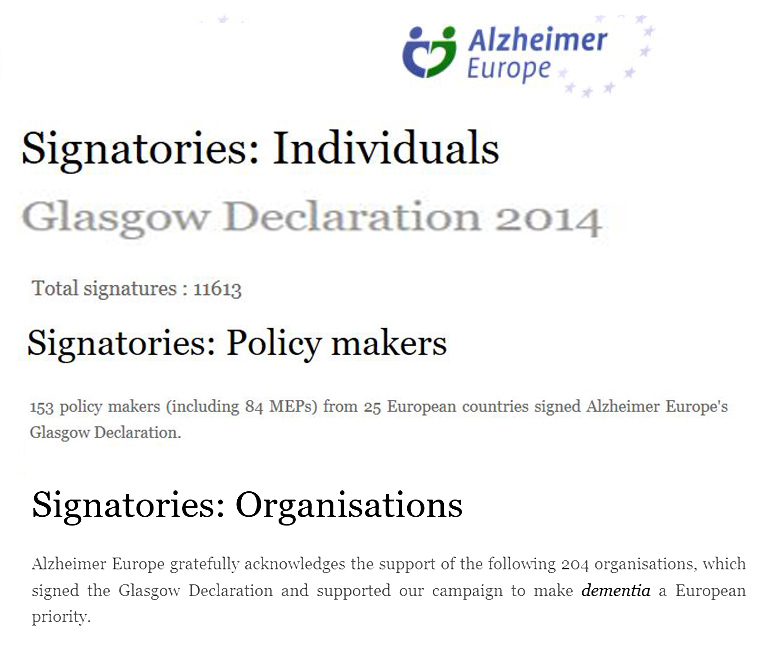 It was very helpful for you to outline so clearly the Scottish Government’s position on the diagnosis of dementia. I thought it might be helpful if I replied to some of the points you made in this letter but first I wanted to say that I thought your speech to the Alzheimer’s Europe Conference held in Glasgow was very good. 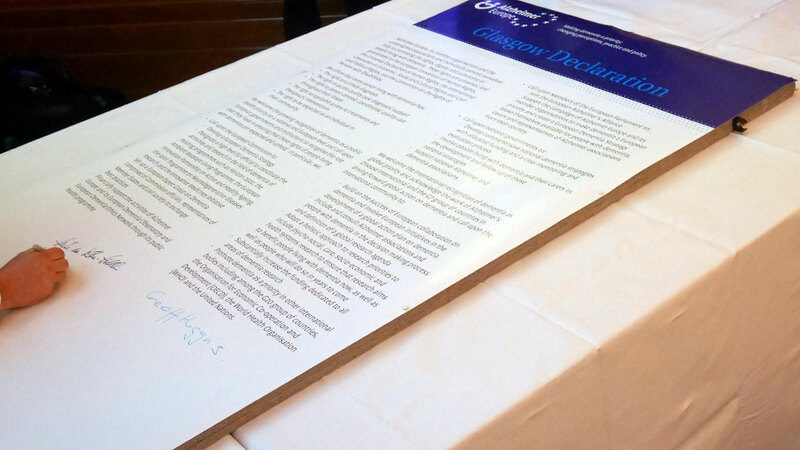 I was delighted to hear about the “Glasgow Agreement” based on rights & dignity of individuals and to see this signed by representatives of all walks of life. I think to have Scotland lead the way here is a matter in which we can take much pride. 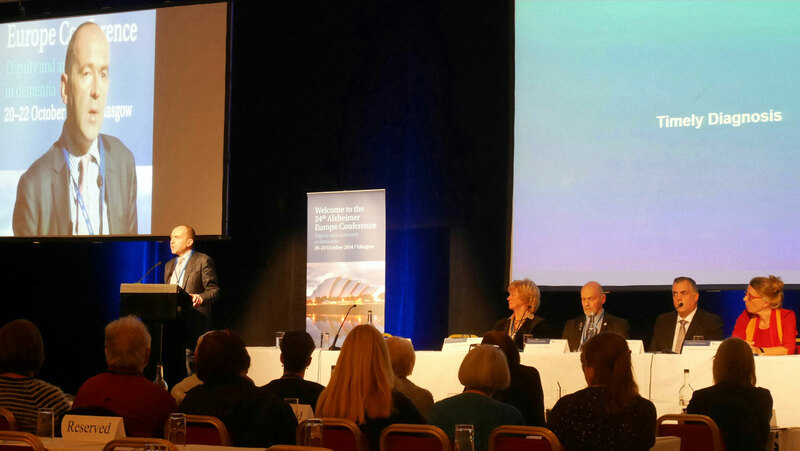 The level of inclusion at the conference of those living with dementia was inspirational. The value of experience in terms of shaping policy should never be lost. My only concern is that many of the patients I see with cognitive changes are very elderly and frail and with multiple health problems. So we must be careful to include this group’s very quiet voice. They tend not to have straightforward “Alzheimer’s”. I have many interests and so I am an advocate for scientific pluralism when it comes to the subject of wellbeing. As a general point I would like to reflect on my experience in the last four years or so where I have not found it easy to raise ethical considerations. I refer both to my experience as an employee of NHS Scotland and indeed my “engagement” with Healthcare Improvement Scotland. I would hope you might investigate how ethical matters can have a routine place in healthcare in Scotland. It is also my view that scientific methodology requires to include critical voices. History reminds us time and again that well-intentioned policies can have unforeseen consequences. I am hugely impressed at your personal determination to see that concerns can be raised without what has happened to me and others: isolation and mischaracterization. I want to thank you for this. 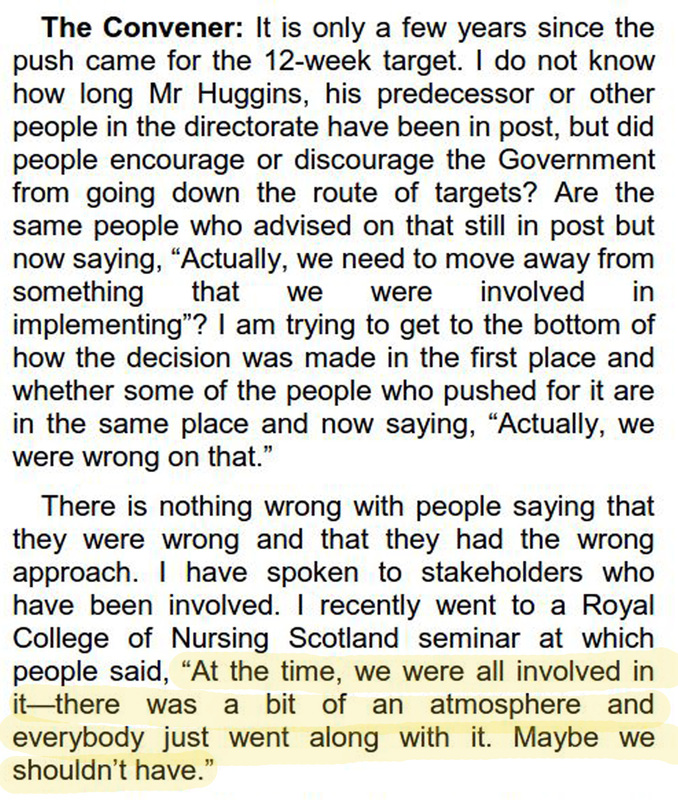 My experience in NHS Forth Valley for raising ethical considerations and trying to be a voice for those most vulnerable (generally our very elderly) was far from easy. I had the same experience for raising transparency and following HDL 62 which has been extant for over 10 years. The incentivised approach to the “early diagnosis of dementia” as set out explicitly in HEAT Target 4 first raised concerns for me in day-to-day practice. This target was pursued by senior Scottish Government officials most rigorously. Here it is worth looking at the evidence presented to Westminster’s All Party Parliamentary Group by senior Scottish Officials (Government and Clinical). Phrases used included “being careful to take out saboteurs” and an approach suggested that Senior Managers and Clinicians should be taken around the “back of the bike shed” if they disagreed with policy. I am of the view that such approaches are unhelpful and unethical. 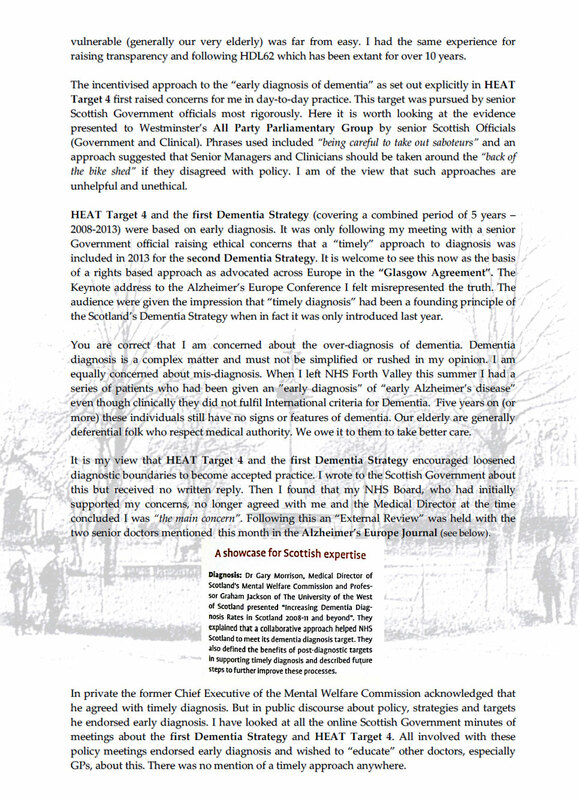 HEAT Target 4 and the first Dementia Strategy (covering a combined period of 5 years – 2008-2013) were based on early diagnosis. It was only following my meeting with a senior Government official raising ethical concerns that a “timely” approach to diagnosis was included in 2013 for the second Dementia Strategy. It is welcome to see this now as the basis of a rights based approach as advocated across Europe in the “Glasgow Agreement”. 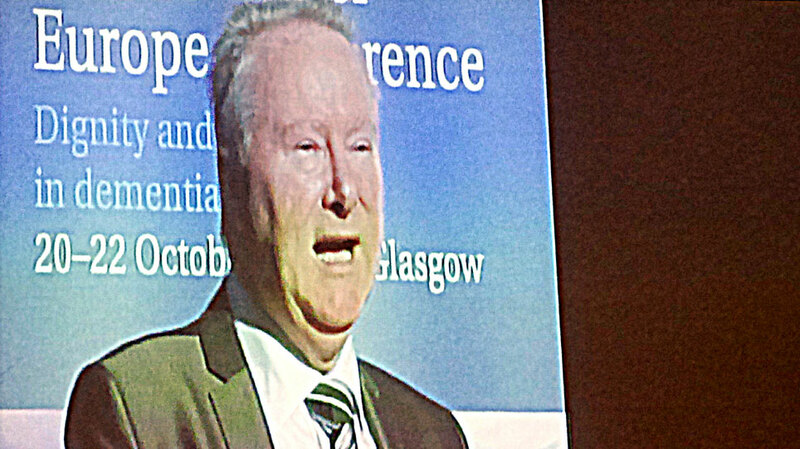 The Keynote address to the Alzheimer’s Europe Conference I felt misrepresented the truth. 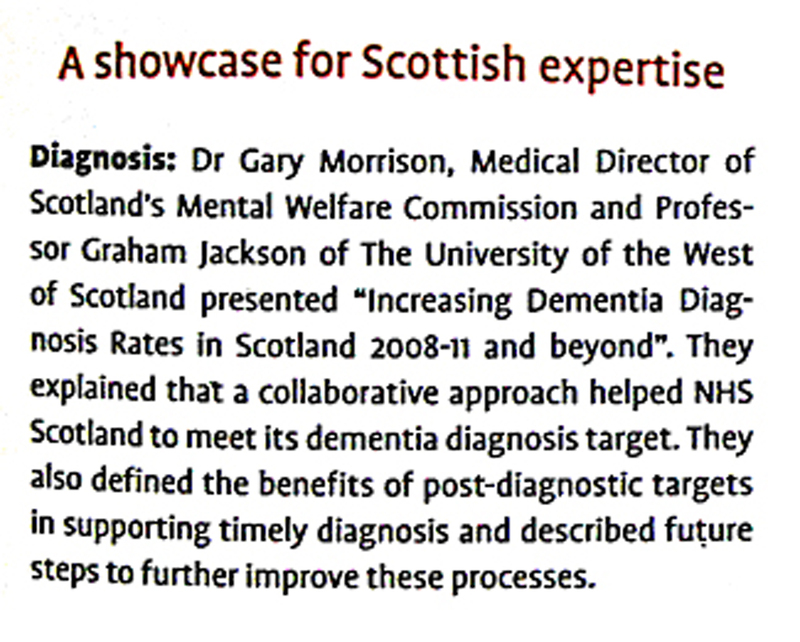 The audience were given the impression that “timely diagnosis” had been a founding principle of the Scotland’s Dementia Strategy when in fact it was only introduced last year. You are correct that I am concerned about the over-diagnosis of dementia. Dementia diagnosis is a complex matter and must not be simplified or rushed in my opinion. I am equally concerned about mis-diagnosis. When I left NHS Forth Valley this summer I had a series of patients who had been given an ”early diagnosis” of “early Alzheimer’s disease” even though clinically they did not fulfil International criteria for Dementia. Five years on (or more) these individuals still have no signs or features of dementia. Our elderly are generally deferential folk who respect medical authority. We owe it to them to take better care. It is my view that HEAT Target 4 and the first Dementia Strategy encouraged loosened diagnostic boundaries to become accepted practice. I wrote to the Scottish Government about this but received no written reply. Then I found that my NHS Board, who had initially supported my concerns, no longer agreed with me and the Medical Director at the time concluded I was “the main concern”. Following this an “External Review” was held with the two senior doctors mentioned this month in the Dementia in Europe magazine (see below). In private the former Chief Executive of the Mental Welfare Commission acknowledged that he agreed with timely diagnosis. But in public discourse about policy, strategies and targets he endorsed early diagnosis. I have looked at all the online Scottish Government minutes of meetings about the first Dementia Strategy and HEAT Target 4. All involved with these policy meetings endorsed early diagnosis and wished to “educate” other doctors, especially GPs, about this. There was no mention of a timely approach anywhere. 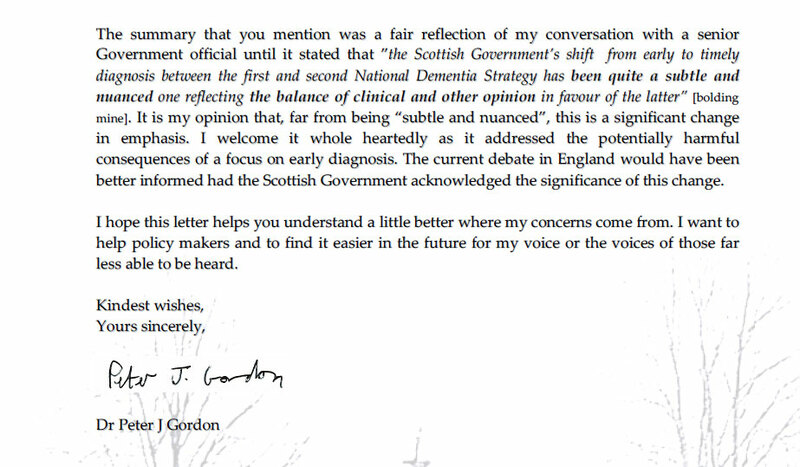 The summary that you mention was a fair reflection of my conversation with a senior Government official until it stated that ”the Scottish Government’s shift from early to timely diagnosis between the first and second National Dementia Strategy has been quite a subtle and nuanced one reflecting the balance of clinical and other opinion in favour of the latter” [bolding mine]. It is my opinion that, far from being “subtle and nuanced”, this is a significant change in emphasis. I welcome it whole heartedly as it addressed the potentially harmful consequences of a focus on early diagnosis. The current debate in England would have been better informed had the Scottish Government acknowledged the significance of this change. I hope this letter helps you understand a little better where my concerns come from. I want to help policy makers and to find it easier in the future for my voice or the voices of those far less able to be heard. Such a statement seems back-to-front. 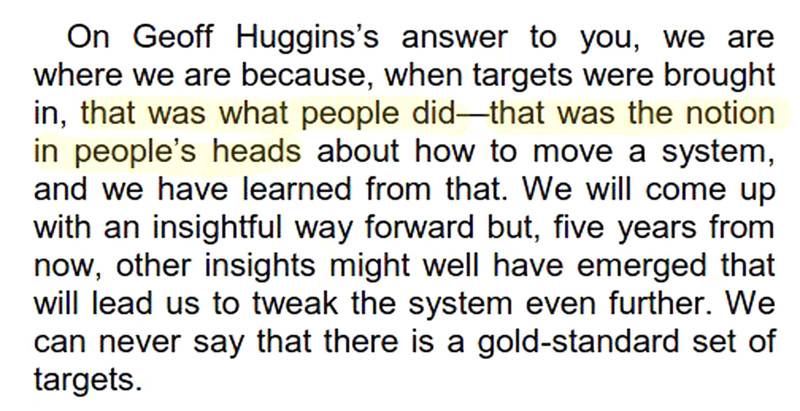 It was Geoff Huggins who addressed Westminster Parliament in person to say that any “saboteurs” to HEAT Target 4 would be addressed by taking them “behind the bike shed”. @PeterDLROW: “My experience in NHS Forth Valley for raising ethical considerations and trying to be a voice for those most vulnerable (generally our very elderly) was far from easy. I had the same experience for raising transparency and following HDL62 which has been extant for over 10 years. Very concise post and well written. What jumped out at me throughout this was the fact that the credit for ‘timely diagnosis’ should go to you Peter. Whereas it’s been hijacked by others who have taken credit for it. I am very glad though that we’ve not gone with NHS England and payments to GP’s. I can’t for the life of me understand how this is going to make things any better, in fact quite the opposite. It’s going to destroy families who later find out that it’s been incorrectly diagnosed.